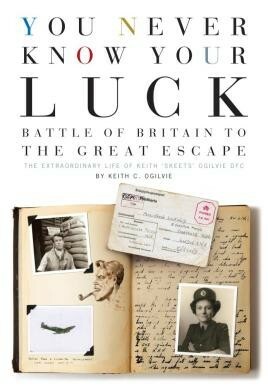 The story of Keith 'Skeets' Ogilvie who became an 'Ace' flying Spitfires during the Battle of Britain, was shot down, and was one of those fortunate not to have been murdered by the Gestapo having taken part in the famous 'Great Escape' from Stalag Luft III. Unfortunately, due to sales rights restrictions, we cannot offer You Never Know Your Luck for sale in your country. When the Royal Canadian Air Force wouldn't accept him as a pilot in the summer of 1939, Keith ‘Skeets' Ogilvie walked across the street in Ottawa and joined the Royal Air Force. A week later he was on a boat to England and a future he could not have imagined. Some unusual luck won him a transfer as a Spitfire pilot to No. 609 (White Rose) Squadron, just as the Battle of Britain was being joined. Over the next months he firmly established his credentials with six confirmed victories and two probables, along with several enemy aircraft damaged. Shot down over France the following July, he was fortunate to be treated for grievous injuries by top German surgeons. Skeets' home for the balance of the war was Stalag Luft III prison camp. He was the second last man out of the ‘Great Escape' tunnel but was recaptured three days later. For reasons he never understood, Skeets was one of 23 escapees who were spared from being murdered by the Gestapo. 50 of his fellows were not so lucky. In London on a night off from flying duties, Skeets had been introduced to a fellow Canadian expatriate, Irene Lockwood. While he was testing the limits of his luck, his future wife was experiencing her own adventures in London, living through the daily stress of the Luftwaffe bombing campaign and working with MI12, and later as a wartime photographer with the RCAF. You Never Know Your Luck is the story of two modest people who found themselves in extraordinary circumstances, and who rose to the occasion like so many of their contemporaries. Skeets' and Irene's own words and memories are the foundations on which the experience of wartime unfolds. A unique perspective from individuals who never failed to wonder at their own fortune.